August 1, 2012, Auburn Hills, Mich. - The 2013 Jeep Grand Cherokee SRT8 is the most powerful, technologically advanced, high-performance Jeep vehicle ever -- featuring a combination of Jeep's legendary capability and utility, merged with the renowned advanced performance engineering from Chrysler Group's Street and Racing Technology (SRT) team. Delivering outstanding driving performance in all conditions, and complemented by key SRT attributes -- including functional, performance-oriented styling, world-class ride and handling, benchmark braking and race-inspired interior appointments -- the 2013 Jeep Grand Cherokee SRT8 runs from 0-60 mph in 4.8 seconds, 0-100-0 mph in the mid-16 second range, can cover the quarter mile in the mid-13 second range, has a top speed of 160 mph, and brakes from 60-0 mph in 116 feet. Powering the 2013 Jeep Grand Cherokee SRT8 is the 6.4-liter HEMI V-8 with Fuel Saver Technology that delivers 470 horsepower (351 kW) and 465 lb.-ft. (630 N-m) of torque. An active intake manifold and high-lift camshaft with cam phasing delivers maximum low-end torque while optimizing high-end power across a wide rpm band. Specifically, 90-percent of peak torque is available between 2,800 and 6,000 rpm, allowing for inspired standing starts and improved straight-line performance. Standard Fuel Saver Technology and an active valve exhaust system allows four-cylinder operation to engage over a wide rpm range, to deliver both fuel efficiency and an extended range of 450 miles on one tank of gas. Standard steering wheel mounted paddle shifters join the standard Auto Stick on the floor. Both are mated to a proven automatic transmission, allowing a choice of spirited shifting on the road and the racetrack. Both methods give the driver the ability to shift while the transmission controller calibration prevents situations that might over rev the engine. Fully adaptive electronic control of all shifting makes the powertrain more responsive while minimizing harshness. In 2011, all Jeep Grand Cherokee models received a vastly improved and refined on-road ride thanks in part to the vehicle's new body structure. Torsional stiffness was improved 146 percent versus the previous generation model, for improved ride, durability and reduced noise, vibration and harshness. The improvements were achieved with more than 5,400 welds in the body alone, marking a 53-percent increase in spot welds, a 42-percent increase in arc welds and a 38-percent increase in structural adhesive. The standard Jeep Quadra-Trac SRT active on-demand four-wheel-drive transfer case uses input from a variety of sensors in order to determine tire slip at the earliest possible moment and take corrective action. The system uses Throttle Anticipate to sense quick movement in the throttle from a stop and maximizes traction before slippage occurs. When tire slippage is detected, the Jeep 4x4 system can transfer up to 100 percent of available torque to one rear wheel. The transfer case also enhances handling by proportioning torque between the front and rear axles to maintain the driver's intended path. The Grand Cherokee SRT8 also features an Electronic Limited Slip Differential, which eliminates rear wheel slip and improves handling. The performance-tuned, fully hydraulic steering system uses a heavy-duty pump and pump cooler. Revised gearing gives drivers more direct feel and on-center response. Split 5-spoke, 20-inch forged aluminum wheels ride on P295/45ZR20 Pirelli Scorpion Verde All Season run-flat tires or available Pirelli P Zero Three-season. 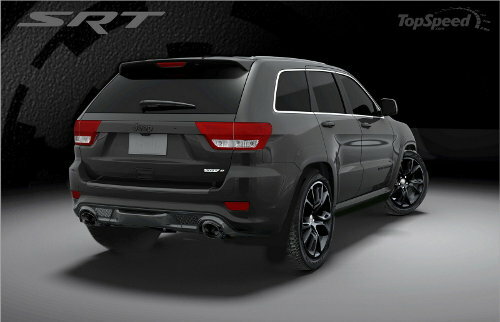 Rounding out the capability of the 2013 Jeep Grand Cherokee SRT8 is a trailer tow rating of 5,000 lbs. Chrysler Group's SRT vehicles are well known for their world-class braking. Stopping power for the 2013 Grand Cherokee SRT8 comes courtesy of SRT high-performance Brembo brakes with four-wheel anti-lock brake system (ABS). Stopping distance performance of 116 feet from 60-0 mph is made possible by red-painted, Brembo 6-piston (front) and 4-piston (rear) calipers, and vented rotors at all four corners measuring 15-inches (front) and 13.8-inches (rear). 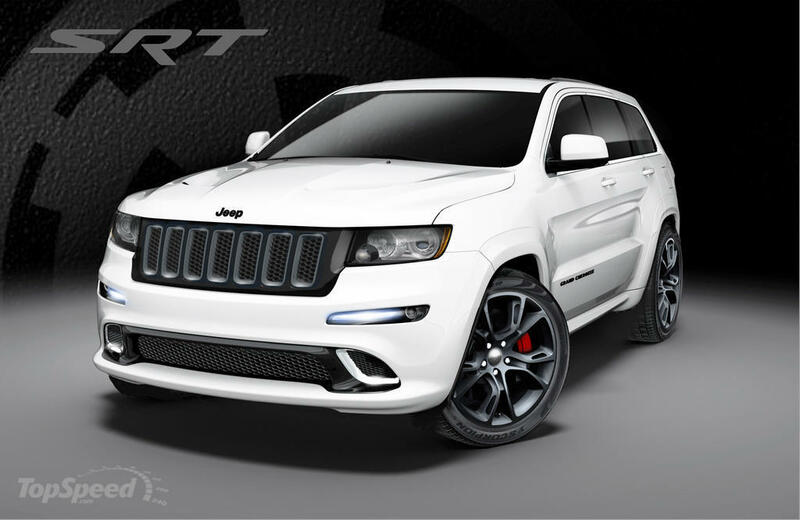 The functional performance exterior of the 2013 Grand Cherokee SRT8 features the "planted" look of a high-performance sports car by being lowered 1 inch and adding SRT-exclusive, body-color wheel flares and side sill cladding. 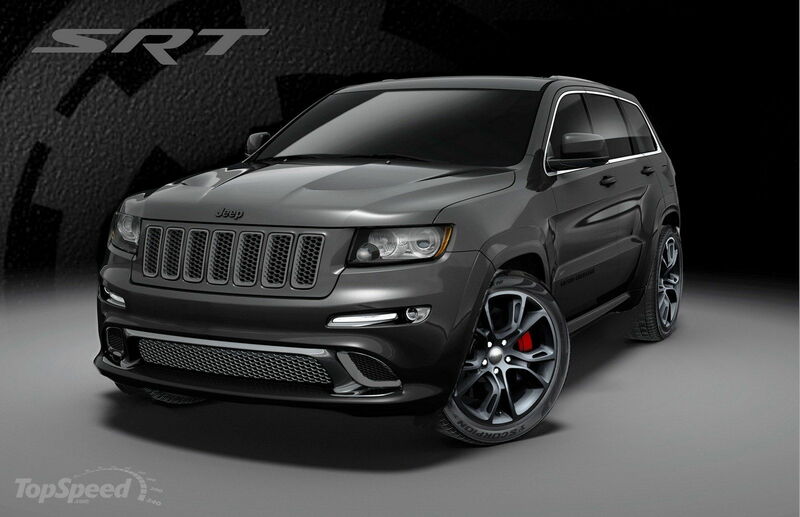 A one-piece front fascia contains LED multi-function daytime running lamps that result in an exclusive face for the Jeep Grand Cherokee SRT8, while a body-colored front grille with a unique black screen background and chrome bezel inserts add to the aggressive look. The integrated lower front grille is painted in gloss black and a underbody belly pan features integrated brake ducting to improve cooling and fade performance. Completing the front end is a sculpted hood with functional dual black heat extractors for added engine cooling. 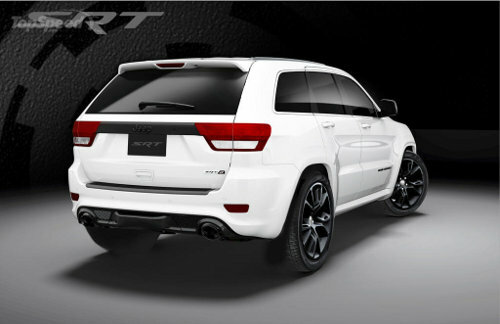 At the rear, the SRT performance influence continues with a liftgate spoiler that reduces drag and improves downforce. A unique one-piece rear fascia includes a separate air diffuser along with an available trailer receiver and access cover. The dual-sport exhaust system features 4-inch exhaust tips. New for 2013 are two special models of the Jeep Grand Cherokee SRT8 including the bright white "Alpine" edition and brilliant black "Vapor" edition. The 2013 Jeep Grand Cherokee's refined, luxurious interior takes on a performance feel in SRT8 form with race-inspired technology and SRT-exclusive appointments. The leather-wrapped, heated steering wheel features a unique satin chrome rim section with a flattened bottom surface -- evoking a race-inspired cockpit -- that showcases the SRT logo. Standard paddle-shift controls flank both sides of the contoured palm rests while all audio and Electronic Vehicle Information Center (EVIC) controls are accessible from the horizontal spokes on the steering wheel. A power tilt and telescoping steering column also is standard. SRT-exclusive Performance Pages show instant feedback on steering input measurements, horsepower, torque, 0-60 mph time, 60-0 mph braking distance, G-forces, and one-eighth mile and quarter-mile times, along with expanded engine information. Standard SRT-styled Nappa leather and suede seats, with sculpted bolsters and adjustable headrests, provide all the comfort for daily drives -- and "grip" to keep the driver and passengers in place during spirited driving. The embroidered SRT logos and contrast stitching accent the two front seats. Heated (front and rear) and ventilated (front) seats are standard. Also standard for 2013 are premium leather door trim panels, instrument panel and center console along with a power liftgate. Carbon fiber accents are integrated into the instrument panel and door trim panels and bright, racing style brake and pedal pads add to the high-performance look inside the cabin. An available Command View dual-pane sun roof provides twice as much glass surface than a standard sun roof and extends from the windshield to the rear of the vehicle. Premium navigation and SiriusXM Travel Link are standard with the 730N Media Center CD/DVD/MP3/HDD radio. Also standard are a multitude of features including SiriusXM Satellite Radio and Uconnect Phone. The available Vehicle Entertainment System (VES) includes a DVD player and rear seat overhead screen that deliver a variety of programming choices, with ports to connect games and media players with audio and video output capability, including iPod connectivity. The Media Center or the VES remote can control multiple screen inputs and each screen can play something different. The available 825-watt, 19-speaker premium SRT performance audio surround-sound system from Harman Kardon offers world premier innovation, featuring a 32-volt Tracking Power Supply (TPS) 12-channel Class D amplifier that delivers outstanding acoustics and brings multi-dimensional, quality sound for all interior occupants. GreenEdge speaker and amplifier technology offers superior sound quality and high Sound Pressure Level outputs with minimum energy consumption. GreenEdge amplifiers alone outperform traditional amplifier efficiency by up to 55 percent, representing a net efficiency of more than 90 percent in some cases. The speakers are tuned for maximum efficiency and perfectly matched to the amplifier output. The system's 19 GreenEdge high-efficiency speakers include nine tweeters, five mid-range speakers, two mid-woofers and three subwoofers located throughout the interior. The 2013 Jeep Grand Cherokee SRT8 is built at the Jefferson North Assembly Plant in Detroit. The Manufacturer's Suggested Retail Price (MSRP) is $59,995 (plus $925 destination). MSRP for the Alpine and Vapor special edition packages is $2,495. Owners of any Chrysler Group SRT vehicle receive one day of professional driving instruction as part of the SRT Track Experience, designed to maximize their driving knowledge and skills on the street or track. Sessions are held throughout the year at selected tracks. The SRT lineup in the 2013 model year features five vehicles that are world-class performance contenders and bring the latest in safety technologies and creature comforts. The Chrysler 300 SRT8, Dodge Challenger SRT8 392, Dodge Charger SRT8 and Jeep Grand Cherokee SRT8 are joined by the SRT flagship Viper and Viper GTS models which are making their highly anticipated return to the high-performance sports car market. Built on more than 70 years of legendary heritage, Jeep is the authentic SUV with class-leading capability, craftsmanship and versatility for people who seek extraordinary journeys. The Jeep brand delivers an open invitation to live life to the fullest by offering a full line of vehicles that continue to provide owners with a sense of security to handle any journey with confidence. The Jeep vehicle lineup consists of the Compass, Grand Cherokee, Patriot, Wrangler and Wrangler Unlimited. To meet consumer demand around the world, all Jeep models are sold outside North America - and all are available in right-hand drive versions and with gasoline and diesel powertrain options. Chrysler Group LLC sells and services vehicles in approximately 120 countries around the world.